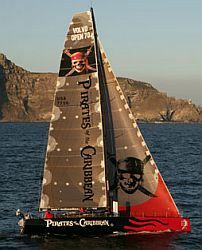 The 5th leg of the Volvo Ocean Race round-the-world yacht race started yesterday. They left Rio de Janeiro, Brazil headed for Baltimore, Maryland, USA - a distance of about 5000 nautical miles. They have a scoring gate at Fernando de Noronha off Brazil. Winds at the start yesterday were very light making for some exciting place changes. A GE Community member called 'lucifer666' has written a program for tracking the Race. You should download the Volvo Ocean Race file now and see the history of the previous four legs and watch the LIVE race in Google Earth (if you don't re-download the file you will be missing the previous leg).